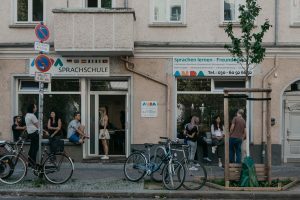 Anda Sprachschule is a small and friendly school in Berlin Friedrichshain and Berlin Prenzlauer Berg offering language courses for adults and companies. Our teachers are native and highly experienced in teaching languages and their sole aim is to deal with the needs of our students. We are different from other schools due to our communicative and personalized lessons tailor-made to our students needs, in our language courses we give a great importance to our students’ communication skills. The courses are held in our school or can be held in your office upon request. Offers different types of courses that take place between 09:00 and 21:00. The extensive courses usually last 3 months, but there´s also the possibility to book for more weeks or for a shorter period. Why should I register for Anda Sprachschule? Evening courses: Courses for each language that take place once a week (2 lective hours per day). Semi-Intensive courses: Courses for Spanish, English and German that take place twice a week (2 lective hours per day). Intensive courses: Courses fro German, English and Spanish that take place five times a week (4 lective hours per day). Super-Intensive courses: Courses for Spanish and English that take place five times a week (6 lective hours per day). Private lessons: Adapted to the exact needs of the student both in contents and in times, and can take place in the morning, noon or evening. If it is the first time that you have registered with us but you already have some language language skills we will also be pleased to assist you. Moreover you can take our free test level.